Canine Chiropractics for show dogs has many of the same aims as for Athletic dogs. Many owners of show dogs put a lot of time & resources into training and travelling to events. 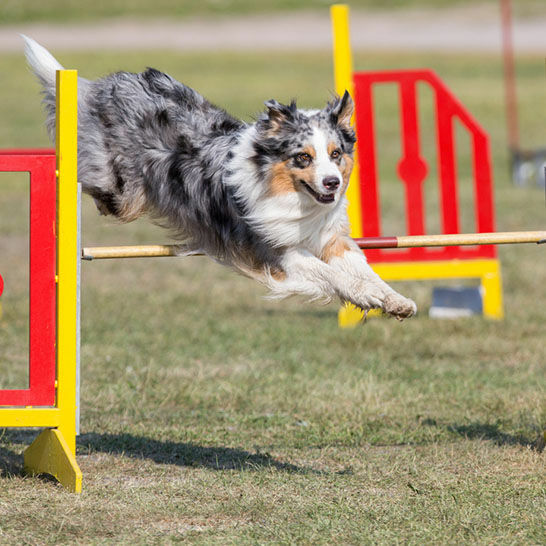 Canine Chiropractic may support show dog owners in their program as it may assist their show dogs being physically and mentally at their optimum and may therefore provide a natural competitive advantage. In conformation shows, trial and many events judges are often looking at how the dogs entire body-spine and extremities are moving-the rhythm, freedom and other aspects of gait. Judges will often also be looking closely at a dogs posture / confirmation and the overall demeanour of the dog, here again Canine Chiropractic may help. Dogs that are carrying biomechanical joint and muscle problems; that may or may not be painful, can often exhibit posture changes such as functional top-line roaching or sway back, holding the head too high or low, reduced fluidness of movement, stiffness and other gait changes. These vertebral problems may also result in behavioural & attitudinal changes where the dog is anxious or not as relaxed or as ‘sparky’ or spritely as it could be in the show ring. While it is important to highlight that chiropractic work is not aimed at removing structural conformational or body shape and proportion problems or ‘faults’ from a breed standards perspective, that a dog is born with or develops. Canine Chiropractic may help functional biomechanical problems of joints & muscle myospasm, that may contributing to changes such as a top line ‘roach back’ resulting from vertebrae of the mid-low back being fixated / locked up in an overly flexed position. Functional postural problems, restricted movement because of joint biomechanical dysfunction and pain effecting demeanour many result in judges penalizing a dog, when the problem may be an issue that could resolve with care, rather than it being judged as a permanent structure fault by the breed standard. To deal with existing vertebral dysfunction that may be contributing to problems such as movement restrictions, gait or demeanour problems ie treatment may help to eliminate or improve those problems that could result in being penalization by judges in the show ring or at the event. Performance enhancement with natural manual therapies the may actually improve or optimise the dogs functional posture, movement, mood and well-being. ie the care may help to naturally enhance and accentuate the positive features and characteristics of the dog in the show ring. At Aligning Canine Chiropractic we really enjoy working with show dogs and their owners as they prepare for important shows-perhaps even being considered part of their support team. Helping Show dogs perform at their best ! !